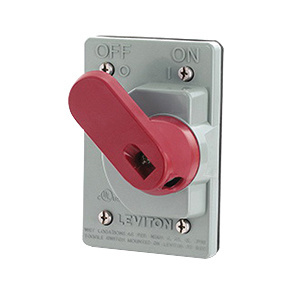 Leviton Wetguard® 1-Gang Industrial grade adjustable radius lever in gray color, use with all 15 - 40-Amp toggle switches including manual motor starters. It withstands current rating of 15 to 40-Amp. It measures 3.13-Inch x 2.47-Inch x 4.63-Inch. This water-tight lever comes with Valox PBT cover and santoprene TPV gasket.